Some people are just ignorant and ask, probably not even realizing it's a cultural/religious thing. I keep mine at home, I don't think any friends ever asked what was in it. In high school when I still had friends, they were too obsessed with boys. I have found that most people don't ask for specifics much anymore regarding mine. I carry several bags for different reasons and many are out of sight. Some are personal for mySelf, some are for Helping and/or Healing. Often people may ask is that a Medicine Bag and when I answer in the affirmative that is usually all that they ask. For those who wish to know More...well sometimes I "ask" the contents ( in case there is a Need of some kind for the person asking) and my Spirit Guides..and proceed from there. If I am not "led" to explain or share in anyway I simply say that the contents are Personal to Me Alone. Regarding medicine bags, I know that their contents are very personal and symbolic to the owner of the bag. It's commonplace to not share the contents with others, neither through taking them out and showing them nor saying what's inside. Since I've begun to carry my medicine bag with me, and specifically wearing it over the shirt (it's a small necklace one, a couple inches or so but decorated), I've had a decent number of people - both familiar and stranger - asking me what's inside. My typical response is to say "some crystals", to help preserve the privacy of the contents, but I notice it both doesn't seem to often be enough and that I don't feel good about doing it. One or twice I've simply said that the contents were spiritual things from nature. It got me thinking about what others might say, so I wanted to ask: Of those of you who have a medicine bag, what do you tell people when they ask what's inside of it? For years when working I kept the stones in a safety deposit box. Now I am protecting them. I have recently been working on a new Medicine Bag, as I had a bag given to me, and I felt it would be great for this purpose and felt this to be a great time for a personal Medicine bag, as though I have previously owned a few with specific contents, somehow across many moves and moons I had lost them. I will not reveal the contents inside as they are highly personal. 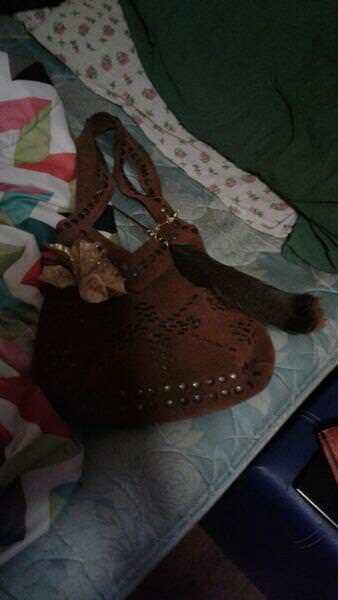 But will give a bit of explanation as to the outer dress of the bag- to say the way I have it decorated. It was stained by the previous owner. I used slightly soapy water- hand soap and water to attempt stain removal, water did not mix well with the material and left a bit of a darkening mark of its own upon the bag. No worries, as I have used a stain covering approach I have used previously with a pocket book. I took a faux arrangement of flowers, material fake flowers, and pulled off a singular gold colored flower from the arrangement, I then pinned it over the stained area with a safety pin. This has symbolism for me only in the color used, I like the gold mixed with brown. It is more practical stain covering embellishment. Next I attached a Turkey feather that was given to me by someone to the strap of the bag, with a goldish colored floral wire. Turkey Feather for me is Symbolism of Gratitude, and the Gratitude for Medicine received or given. I will by my faith use another feather along with the Turkey Feather later on. This feather will either have to come to me as a gift, or if in desperation found. The preferred method is to be given one. It also can not be in the form of another Turkey Feather, but must be of another species of bird. The very next to be given me, or the very next if absolutely no near future chance of one given, to be found. In my faith it must be the very next non Turkey Species, Feather come across, by either gift, or found naturally. It must be of a real bird, no Faux feathers, only Faux stain covering flower. By faith it is imperative the very next given or found is to be accepted, If It Is Non Turkey Species. The very next even if I am not fond of the particular bird. That is my Medicine Bag. I describe how I decorate it, as I follow rules I have set in place by my own Faith. I only aim to describe the way I do things by my Belief System. I am not permitted to explain the contents inside. It got me thinking about what others might say, so I wanted to ask: Of those of you who have a medicine bag, what do you tell people when they ask what's inside of it? I have never yet to be asked that by anyone other than my Father when I first made one, or owned one. He was the one I went to with my shamanic views, and I frequently asked him questions. He wasn't the best to go to though he did have Native like culture books lying around which I read. His issue is he can not get past the books or to say he adopts his views constantly from others. He has never really been quite as interested in native culture or spirituality as I. He is more so religious. I have learned about my faith my own way. Trial and Error, speaking with God, and essentially attempting to communicate with the world of spirit on my own and by myself. Makes for a lot of aloneness, and talking to oneself. As far as anyone asking me if I take my bag out of doors with me- which I have every intention of doing, as it has my supplies or as I prefer call it, my gear. I plan to tell others very sharply and grouchily that it isn't any of their business.